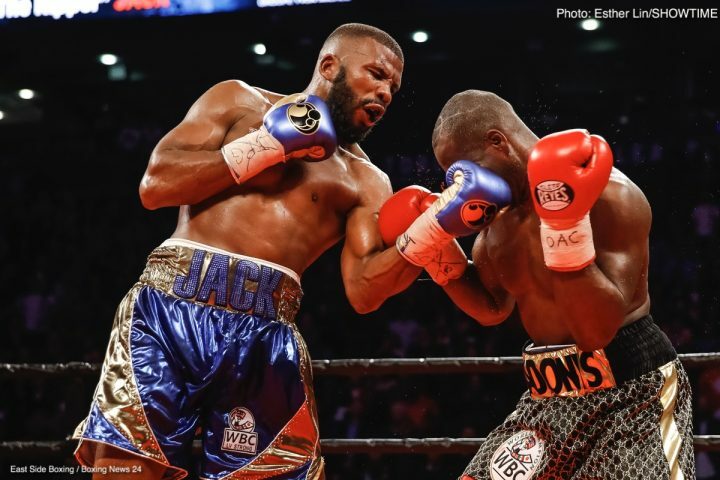 While two-division world champion Badou Jack “The Ripper” wears many hats as an entrepreneur, philanthropist and father, it is his boxing career that has allowed him to be on the path to greatness in and out of the ring. Therefore, he will put his championship-caliber boxing skills on full display on Saturday, January 19 from MGM Grand Garden Arena live on SHOWTIME PPV® against hungry light heavyweight Marcus Browne as the co-main event of the Manny Pacquiao vs. Adrien Broner welterweight championship fight. Jack is no stranger the pay-per-view spotlight as one of the brightest stars in the Mayweather Promotions stable and is preparing to make a statement on January 19. Despite being deep in training camp for this major step in his career, Jack, who was recently named a finalist for the Boxing Writers Association of America’s Marvin Kohn Good Guy Award, has not forgotten his mission outside of the ring – the work he is doing through the Badou Jack Foundation – which focuses on giving children around the world a fighting chance at life. He spent Thanksgiving serving food to those less fortunate at the Catholic Charities of Southern Nevada’s food distribution center and plans to continue to volunteer with them moving forward as well as continuing his work in the Middle East immediately following his fight. While Jack has been in the ring with some very tough customers including Nathan Cleverly, James DeGale, George Groves and Anthony Dirrell, he knows that Browne is coming to fight and try to derail his successful campaign at light heavyweight. Therefore, in addition to the work he is putting in at the gym, Jack has instituted a performance and weight management regimen overseen by renowned nutritionists Lockhart and Leith, whose clients include world-class MMA fighters from Conor McGregor to Cris Cyborg. Additionally, Jack is utilizing his nutrition supplement products Ripper Nutrition before and after each workout as Lockhart and Leith are now official partners in the product, they believe in it so much. Jack has also welcomed Lockhart and Leith chef James Lockwood into camp to prepare each meal as part of this regimen. Senator Manny “Pacman” Pacquiao, boxing’s only eight-division world champion, will face four-division world champion Adrien “The Problem” Broner for Pacquiao’s World Boxing Association Welterweight World Title on SHOWTIME PPV® Saturday, January 19 from MGM Grand Garden Arena in Las Vegas. In undercard action on the SHOWTIME PPV, two-division world champion Badou Jack will battle unbeaten top-rated contender Marcus Browne for the WBA Interim Light Heavyweight Title and former world champion Rau’shee Warren will take on France’s Nordine Oubaali for the vacant WBC Bantamweight World Championship in a rematch of their 2012 Olympic matchup that was edged by Oubaali. In the opening bout of the four-fight PPV telecast, unbeaten Jhack Tepora will take on former world champion Hugo Ruiz in a 12-round featherweight clash for the WBA Interim Championship.